"It's like you're in Hollywood except it's for science and technology so it's just that much cooler." Becoming an engineer was a natural choice for her… it's in her DNA. Her father, also an engineer, didn't push her into the profession though. She was naturally inquisitive and enjoyed learning. Her mother was a history teacher and enjoyed the social sciences. She was made up of the best of both worlds. "I knew I wanted to be an engineer," said Dacie Manion, "but I had 1,000 different interests that had nothing in common." She wanted a discipline at a college that would allow her flexibility in her field. Dacie found the Science, Mathematics and Research Transformation (SMART) program when she was in high school. At the time, she was enrolled in a JROTC program and was close to accepting an Army ROTC scholarship to college. She happened to be Googling scholarships one day and found the SMART program. She felt the SMART program was a better fit for her so she declined the ROTC scholarship. "With SMART, I was guaranteed to do research for the Army," said Dacie. "Although Army ROTC would eventually give me research opportunities, those opportunities wouldn't happen right away." She risked the gamble that she wouldn't be accepted into the SMART program -- the deadline for SMART was later in the year. That gamble, more in line with her career interests, paid off. U.S. Army Tank Automotive Research, Development and Engineering Center (TARDEC), specifically Matt Castanier, a research mechanical engineer in analytics, found her resume and application. He became her mentor. She started at the Massachusetts Institute of Technology in mechanical engineering with a focus in biomedical engineering but later shifted to systems design and engineering. That program included systems design & manufacturing, controls and robotics -- things that she felt were more aligned with TARDEC. Working at TARDEC in the summer helped hone her interests. Dacie enjoyed the software and coding and felt that robotics and autonomy were exciting problems. She credits her internships at TARDEC as the catalyst that shifted her from the medical side of her degree to systems side with a strong interest in robotics. Dacie graduated in June 2015 from MIT with a Bachelor's of Science in Engineering, Mechanical Engineering Dept. She started her SMART service commitment of three years at TARDEC in August 2015. She enjoys gaining more independence in projects as the first year progresses and she is impressed with the nature of projects she undertakes. "I thought it was going to be good, but it's exceeded my expectations," Dacie says. In November 2015, Dr. Ravi Thyagarajan, deputy chief scientist at TARDEC who had worked with Dacie during her first summer here, identified her as a nominee to attend the Black Engineer of the Year Awards (BEYA) STEM Global Competitiveness Conference. In February 2016, Dacie represented TARDEC at the 30th Annual BEYA Conference in Philadelphia. The BEYA Conference focused on topics and careers in the development of science, technology, engineering and math (STEM). 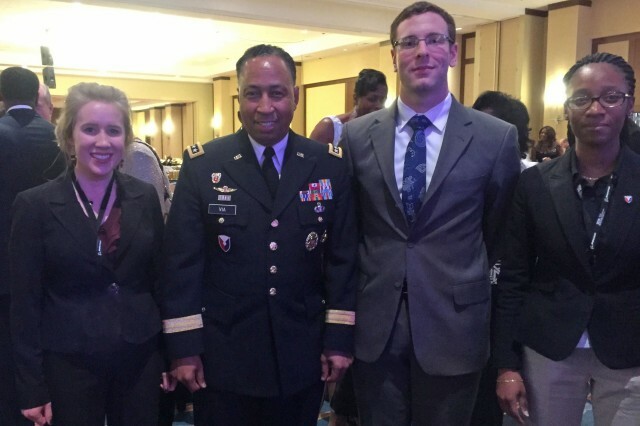 Her role in participating in BEYA was as an intern ambassador for Army Materiel Command and, by proxy, representing TARDEC at the BEYA career fair. The career fair, held on Friday and Saturday during the conference, was primarily aimed at college-aged students who were looking for a career in STEM. AMC wanted to promote Army careers and she, along with two other recent graduates from RDECOM, talked to the student attendees. "It's always good for students to talk to someone who looks a little bit closer to their place in life," explained Dacie. "We're only one phase beyond them." At the same time that the Army is trying to inspire, educate and empower students from a very young age, Dacie had the chance to speak to several middle and high school students. She asked them what classes they were taking, what interested them, and what their dreams and goals were. "Middle school is the time when I feel girls give up on math and science," explained Dacie. "It starts in sixth grade." Dacie was involved in the Society of Women Engineers in college and is now a professional member. She held a leadership position in SWE for several years and did outreach with middle schoolers. "By high school, it's almost too late... especially with girls," she cautioned. When she wasn't at the career fair, Dacie attended the BEYA seminars. She felt the conference was very inspiring and an excellent learning opportunity. Each evening of the conference held a different theme. The Stars and Stripes Dinner, the military-themed event, was on Friday night. "I was so honored by the chance to talk with several one- and two- star generals from the Army Corps of Engineers at the dinner table," said Dacie excitedly. Dacie met Gen. Dennis Via, commanding general of Army Materiel Command. 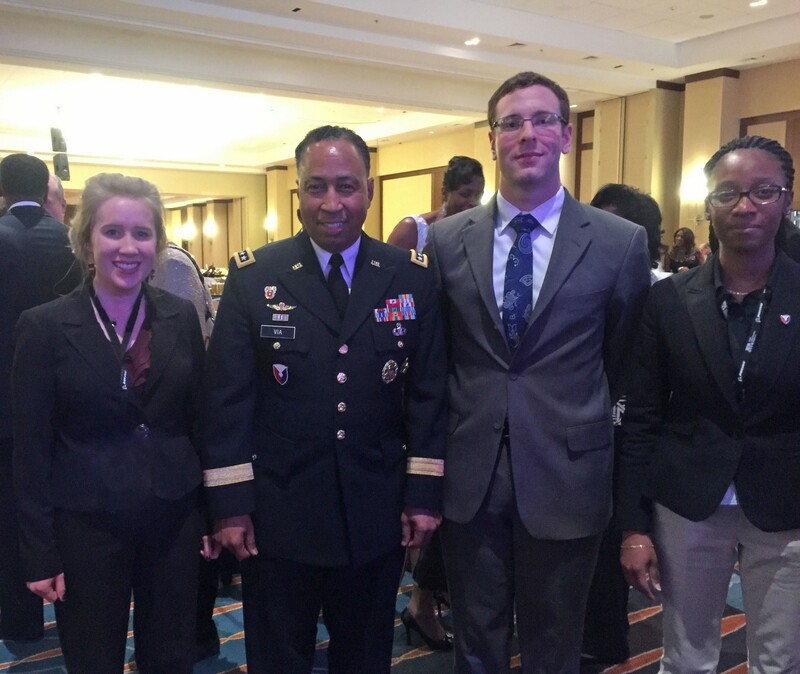 "Participation in the (BEYA) STEM Conference is mission critical because it provides Army Materiel Command (AMC) an opportunity to engage and attract talent by raising awareness of STEM career opportunities in the Command," stated Via in a recent memo. Dacie, slightly star-struck at the evening event, was very excited to have her part in the overall mission. "It's like you're in Hollywood except it's for science and technology so it's just that much cooler," she said eagerly. "It was an unforgettable opportunity to connect with amazing students as well as talk to innovators and leaders across government, academia, and industry throughout the conference," said Dacie. "I think it's a great time to be an Army engineer: talent fresh out of school is poised so well to absorb the knowledge of our retiring workforce and apply it as things are changing in response to new technology, industry standards, and warfighter missions." "[The conference] rivaled graduating from college as a lifetime experience," smiled Dacie.